The Global dimension given to education at K.R. Mangalam World School, Vikaspuri ensures that our young students develop a responsible, international outlook, based on an appreciation of the impact of their personal values and behaviours on global challenges. Among many such end eavours is the Student Exchange Programme which helps to take education beyond the confines of the classroom and country to give our young learners a first-hand peek into the culture and lifestyle of their counterparts in another country. Under the Swiss Indian Classroom programme between K.R. 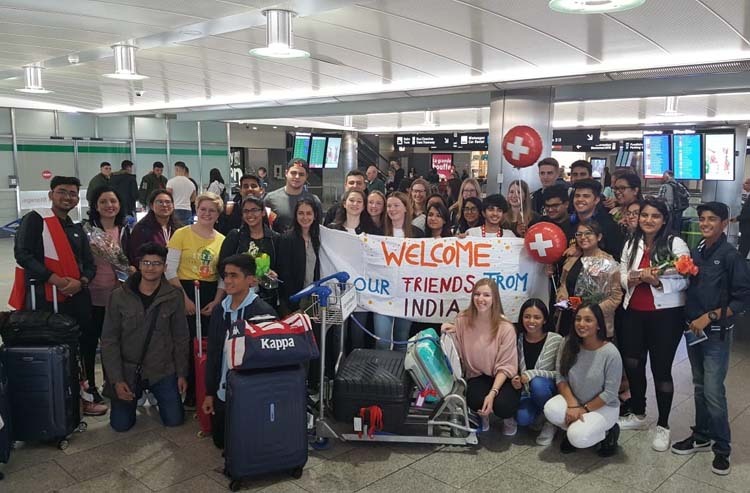 Mangalam World School, Vikaspuri and Neue Kantonsschule Aarau in Aargau Switzerland, a group of 20 students along with 2 teachers- Ms. Gayatri Tandon and Ms. Shaveta Malhotra from K.R. Mangalam World School,Vikaspuri left for Switzerland on 5th April 2019. They were warmly welcomed at the Zurich airport by Ms.Ria Zoller and Mr. Flavio Rohner along with the host families. The students’ along with their exchange partners will be working on their common project and will also get the opportunity to experience the Swiss education system and to take in the allure and culture of a new land. The delegates will be visiting Mt.Titlis, a mountain of the Uri Alps, located on the border between the cantons of Obwalden and Bern. At 3,238 metres above sea level, it is the highest summit of the range north of the Susten Pass, between the Bernese Oberland and Central Switzerland. Their itinerary also includes visit to farmers’ market and chocolate factory. The school Management & Principal wishes the students and teachers a wonderful stay filled with joy & learning.